Which?’s lab tests have found that some popular steam cleaners struggle to maintain a decent steam output when used repeatedly. Even worse, some completely gave up the ghost when we tried to use them more than once. Two of the worst offenders are from Black & Decker. Its 9IN1 Steam-mop with SteaMitt, also known as the Black & Decker FSMH1351SM, stopped producing steam after just three sessions in which we used the device till its tank was empty and then refilled it. Closer examination found that water had got into the unit and caused it to short circuit. The 15IN1 steam-mop with SteaMitt, also known as the Black & Decker FSMH13151SM, wasn’t much better. When we assessed this model we found that the steam rate it produced dropped off heavily after just 10 runs. When we took it apart, we found the pipe from the pump to the tank had become blocked, severely limiting the flow rate. If you buy either of these devices – both of which cost over £100 – you’re likely to be quickly disappointed with your purchase. 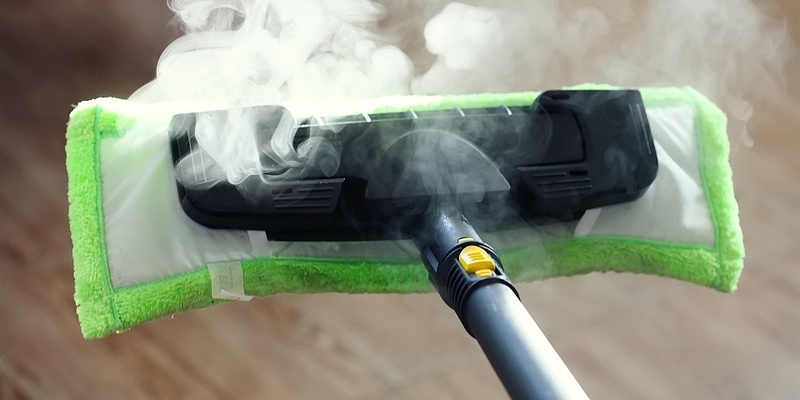 Want to know which steam cleaner you should buy? See our Best Buy steam cleaners. 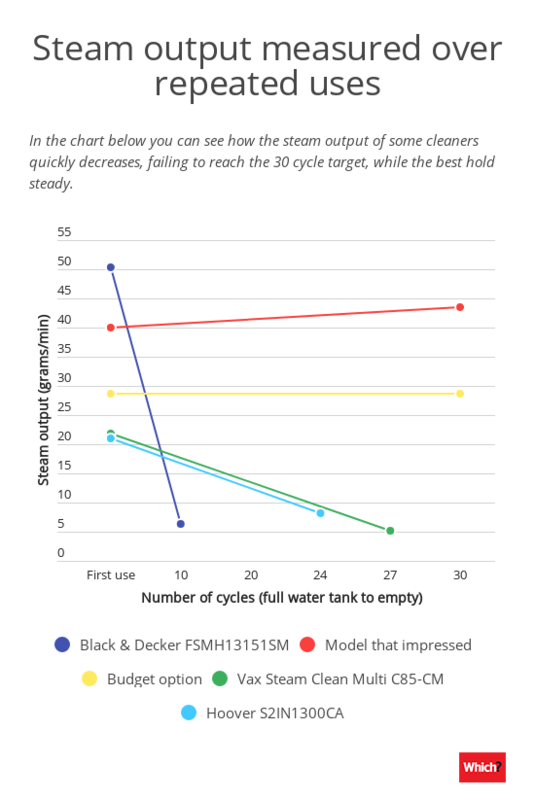 Black & Decker isn’t alone in producing steam cleaners that have failed our long-term use assessment, in which we measure the steam output of each model over 30 full steaming cycles. 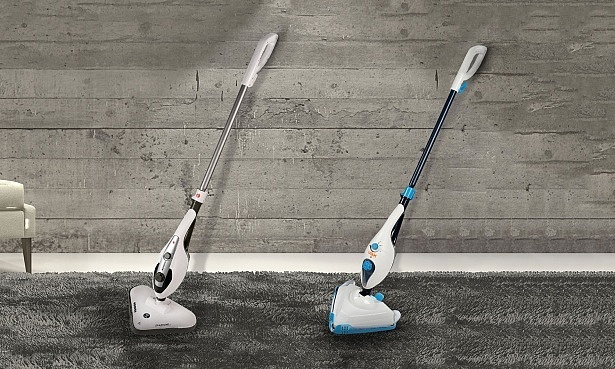 When we tested the Hoover S2in1300A Steamjet, we found that the steam rate it generated dropped by 59% after 24 cycles. The Vax Steam Clean Multi C85-CM stopped working on the 27th run. After that, the pump stopped running and it wouldn’t produce any more steam. By contrast, one budget model suffered no decrease in steam output after 30 cycles. Another model impressed us by actually produced MORE steam after 30 uses than it did on the first run. It’s obviously important that a steam cleaner consistently produces a good amount of steam. But even if it does, it’s no guarantee that it will do a decent job of keeping your house sparkling clean. That’s why we don’t stop once we’ve assessed the long-term performance of every steam cleaner we review, and instead also perform numerous other tests to determine the best – and worst – models. So we assess how well each steam cleaner and steam mop can shift stains from smooth and textured floors and if they can be used on other surfaces, such as bathroom tiles, then we look at how well they clean those too. That’s not all. We also look at how easy each device is to use, rating everything from how simple it is to connect the supplied attachments to how heavy it is to carry. We even measure how long each one will steam for and how long it takes before they’re ready to use. You can see which steam cleaners have impressed in our barrage of tough tests – check out our steam cleaner reviews. Alongside our regular lab tests we also survey* over 1,500 steam cleaner owners every year to find out how their devices perform when they get them home. By crunching this data we’re able to determine which steam cleaner brands are most likely to produce devices that will give you years of trouble free use. The differences between manufacturers can be dramatic. Our latest survey showed that only one in ten steam cleaners made by the best brand experienced a fault in the first seven years of use. But this jumps to one in three for steam cleaners produced by the least reliable manufacturer. You can find out which brands have the most satisfied customers, discover the most common faults that affect steam cleaners and see which brands are most reliable. Go to top steam cleaner brands.